EnviroFlight: Ohio company produces fly larvae to bring down costs of fish stock feed. Inside Glen Courtright’s 20,000-square-foot complex on the outskirts of Dayton, Ohio, there are rows and rows of large bins. From a short distance, these bins appear to be full of loose grains, but get a bit closer, and you’ll see that the grains are actually thousands upon thousands of squirming, wriggling larvae. With a bare hand, Courtright grabs a heaping scoop of the critters and delicately pours them back in. They immediately go back to work, munching on food scraps. “They really are little miracles,” he says. Courtright isn’t just an insect enthusiast. His company, EnviroFlight, aims to turn these black soldier fly larvae into a low-cost, high-protein feed for livestock, starting with fish. “Each bin will produce upwards of 40 pounds of live insects every 10 days,” says Courtright. Because these can be stacked five tall, “every 10 days, we produce the protein equivalent of one pig in a 7-square-foot space,” he says with a satisfied grin. If Courtright can succeed at breeding these bugs on an industrial scale—and convince regulators to approve his bug-based livestock feed—he could transform the food industry. It might also be a partial fix to an impending food shortage: In order to feed the world in the year 2050, food production levels will need to rise by roughly 70 percent. Today’s food industry can’t handle the load. If insects were to enter the global food chain as feed, it could have a meaningful impact on food prices. That’s why the U.S. Department of Agriculture, large farming corporations, and even the United Nations are all paying extraordinary attention to Courtright’s little company in Ohio. Courtright’s path to the bug business began about nine years ago in one of the most remote places on Earth. After 22 years in the military—first as a signals analyst in the United States Air Force, then as an intelligence officer in the Navy Reserve—he had become an expert at designing and troubleshooting high-tech systems. When not on active duty, Courtright worked as a systems engineer and manager for government contractors, designing and building sophisticated electronics systems for defense, automotive, telecommunications, and oil and gas companies. His first idea: launch a biodiesel business. He would make fuel out of oil from local restaurants and food-processing plants. But after researching the idea, raising capital, and building a production facility, Courtright pulled the plug in 2008, when availability of the oil proved unreliable. But Courtright kept turning the idea over in his mind. What else on the planet makes fats and oils for biodiesel? “I looked at enzymes,” he recalls. “Nah, too hard. I’m not a bacteriologist. I looked at algae. That was probably a 20-minute no-go decision. Then it hit me: bugs. They’re easy to grow. At least, I thought they were.” But after toying with the notion of using bugs for fuel, Courtright got a better idea: use the protein and fat in bugs to feed the planet, not power it. The obvious bug of choice was black soldier flies. These insects live in many temperate climates around the world. As larvae, they are extremely efficient at reducing organic materials like food scraps into protein, oil, and fertilizer. And, unlike some breeds of flies, adult black soldier flies don’t bite or spread disease. There was just one, big problem: breeding them on a large scale. Courtright was so excited that he had trouble articulating the big news. When one of his contractors walked by, Courtright gave him the “OK” sign with his left hand and penetrated it with the index finger of his right hand, adding a few pumps for emphasis. In May, EnviroFlight was awarded a patent for that “love shack.” The design, which has since been modified, had included a multichamber stainless steel unit—with an air pipe running through each chamber. The fly pupae reside on the bottom level. When they become adults, they fly up the air pipe to a caged mating chamber with thousands of frisky adult flies. When the larvae reach about 2 centimeters in length, workers cook them in industrial-size ovens and grind them into a powder for feed meal. EnviroFlight has been working for the past year on improving density—getting more feeding chambers into a space, stacked one on top of the other. “I think I’ve cracked the code on how to do this in a high-density factory building. You could do this anywhere—in Brooklyn, in Nairobi,” he says. The costs to run the operation are relatively low. Courtright typically gets food scraps for little or no cost—and in some cases is even paid to take leftover trimmings from food-processing plants. 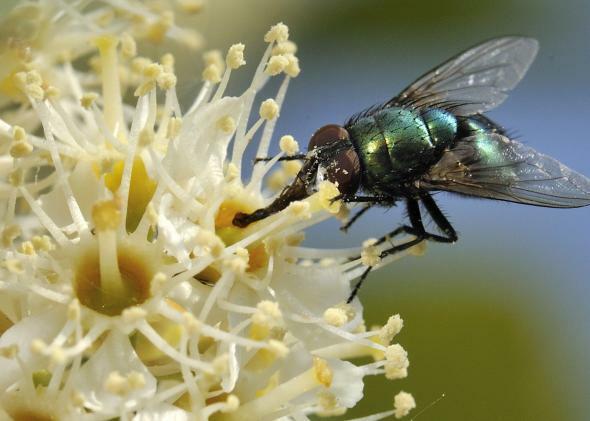 Although EnviroFlight is still awaiting approval from federal regulators to sell black soldier fly-based feed for the animals we eat, the company has been operating at a profit since the fall of 2013, selling insect-based meal to zoos and pet-food makers. (A Florida company, Tasty Worms Nutrition, sells dried, whole fly larvae from EnviroFlight to owners of backyard chickens and exotic lizards, under the brand name Tasty Grubs, at $50 for a five-pound bag.) EnviroFlight also packages and sells the larvae waste as an all-natural fertilizer. As for the livestock feed, Courtright hopes to get the green light from the Food and Drug Administration by the end of next year. (FDA spokeswoman Jennifer Corbett Dooren refused to comment on pending petitions, citing agency policy.) In the meantime, with approval from the Ohio Department of Agriculture, EnviroFlight has been running tests with select fish farmers. Results have been positive. In one research trial run jointly by Ohio State and Kentucky State universities in 2012, freshwater prawns were raised on a diet of either EnviroFlight’s fly-based meal or a traditional feed made for catfish. The prawns grew to be nearly identical in size and taste, says head researcher and aquaculture specialist Laura Tiu. One difference was that the prawns fed on fly larvae were “lighter in color, more like saltwater prawns,” she says, not necessarily a bad thing. The other big difference? EnviroFlight’s feed was 16 percent cheaper. The company is also conducting its own research and trials to get black soldier fly larvae meal registered in the Association of American Feed Control Officials rule book for approved animal feeds, the bible of the industry. Once Courtright has AAFCO approval, which he expects to get next year, EnviroFlight should be able to start selling fly-based meal to farmers of trout, yellow tail, and salmon, and consumers will begin to see fly-fed fish on restaurant menus. EnviroFlight will also be able to sell its insect meal as an additive for pig and chicken feeds. EnviroFlight does have some global competition—a handful of privately funded startups around the world are also trying to produce livestock feed from black soldier flies, including Enterra Feed of Canada, Ynsect of France, Entologics of Brazil, Protix Biosystems of the Netherlands, and AgriProtein Technologies from South Africa. Some have already hit regulatory snags. Kees Aarts, founder of Protix Biosystems, had lined up more than 10 million euros in funding last year for a facility to feed larvae animal byproducts from supermarkets, but investment stalled when the European Food Safety Authority deemed insects to be a “farmed animal” that couldn’t eat another animal. The EU is now weighing what larvae should be allowed to eat as well as what sorts of livestock can eat larvae-based feed. Though U.S. regulators seem more favorably disposed, Courtright still faces another big test: scaling from a prototype to a large commercial enterprise. “Anybody can do something once,” says EnviroFlight investor Carl F. Kohrt, a former board member of the Scotts Miracle-Gro Co. “Can you do it a thousand times? A million times? And get exactly the same results? You have to be disciplined and focused, particularly if your product is to be suitable for human consumption.” Kohrt says he has confidence in Courtright and his “analytical, very methodical” approach. Recently, though, there have been a few hiccups. Last autumn, Courtright had been feeling good about the business—with 10 full-time employees overseeing breeding, milling, and product testing. Then, the polar vortex happened. The company suffered a major power outage during subzero temperatures that wiped out most of the larvae reserved for breeding.